Regiment/Catrawd: 6th Battalion, Welsh Regiment. Service Rank and Number / Rheng gwasanaeth a rhif: Private No. 267059. Military Cemetery/Memorial / Fynwent milwrol: White House Cemetery, St. Jean-Les-Ypres, West-Vlaanderen. Ref No Grave or Memorial / Rhif cyfeirnod bedd: Plot 1: Row A: Grave 34. Killed in action on Thursday 8 November 1917 at the Battle of Passchendaele, aged 21 years. Walter Davies was born in Ruthin, Denbighshire, North Wales in 1897. The 1901 Census shows that the family lived at 14 Ernest Street, Rhyl, Flintshire. The head of the family was John Davies aged 45, who was employed as a Coachman. (a driver of a horse drawn vehicle for the conveyance of one or more passengers and mail). His wife Sarah Davies aged 44 and their 7 (seven) children – William Davies aged 18, an Engine Cleaner, John F Davies aged 16, a Grocer’s Assistant, Owen Davies aged 13, Henry Davies aged 11, Edith Davies aged 9, Gertrude Eliza Davies aged 5 and Walter Davies aged 4 years. Following the commencement of the First World War, Walter enlisted at the Recruitment Centre, Rhyl with 6th Battalion, Royal Welsh Fusiliers and was killed in action on Thursday 8 November 1917. 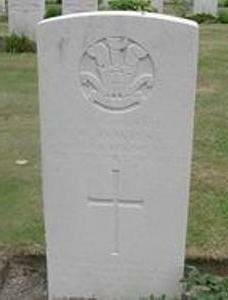 Headstone of Private 267059 Walter Davies. On 20 February 1918, a payment of £5. 11s. 3d was made by the War Office to Gertrude Davies, being monies owed to her brother Walter. On 6 November 1919, a further payment which is recorded as a War Gratuity of £7. 0s. 0d was also made to her. Walter is also remembered on a Remembrance Plaque at The Royal Alexandra Hospital, Marine Drive, Rhyl, Flintshire. and The North Wales Heroes Memorial Arch, Deiniol Road, Bangor, North Wales.